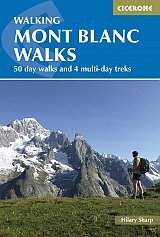 The 54 walks in this guidebook explore the popular region around Mont Blanc (4808m), the highest mountain in Western Europe, showcasing the very best routes on both the French and the Italian sides of the massif. Includes 50 great day walks of 3-20km, and 4 multi-day treks, taking in a variety of terrain including valley footpaths, airy ridges and via ferratas. Walks are Graded 1 to 3: grade 1 walks are manageable by any reasonably fit person on good, usually waymarked paths, while grade 3 routes are long, tough routes, often without waymarking, making navigation difficult: there could also be some scrambling. Additionally there is often a valley walk that can be done whatever the weather, or on rest days, with children, by bike, or as a run. The major centres of Chamonix and Courmayeur are often busy with holidaymakers, but the area has walks equal to anywhere for views, terrain and variety, with their sublime glaciers, high snowy summits, flower-bedecked slopes and rocky trails. Be it spring, summer or autumn, the sheer beauty and range of the walking here will satisfy any hiker - and there are plenty of facilities for the end of the day.